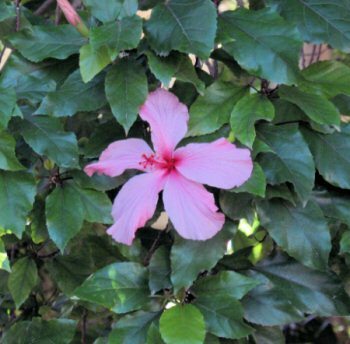 The name Hibiscus refers actually to a genus including about 200 species of plants, a number of which have medicinal uses. 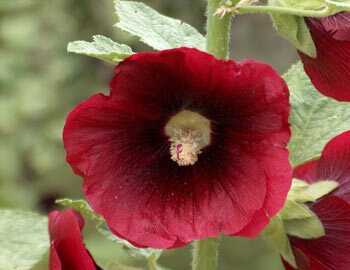 The hibiscus best known for medicinal properties is Musk-Mallow. Musk-mallow is an annual or biennial plant; the stem, growing from 2-6 feet high, bears alternate leaves which are usually sharply lobed and irregularly toothed but sometimes only shallowly lobed and like maple leaves. Both sides are thinly hairy. The large, axillary flowers are yellow and have red centers. An oblong, pointed, hairy capsule up to 3 inches long contains the kidney-shaped, grayish-brown musk-odored seeds. Musky scented perennial; 5-7 feet high. Lower leaves often 3-lobed; median leaves lance-shaped. 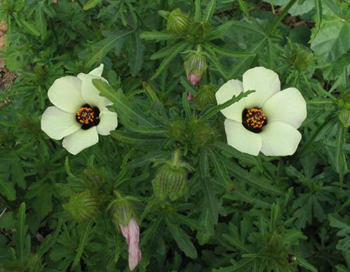 Flowers to 8 inches across; white, with a purple-red center; June to September. Sometimes called mallow rose and wild cotton. 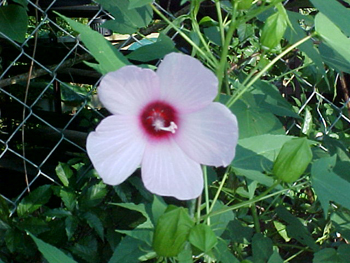 An herbaceous plant of the West Indies which is used like althea. Found in tropics of the Old World. Both roots and fruit are used as demulcents, the leaves as emollient poultices. Known as okra or gumbo. Marsh hibiscus, found in the swamps of the eastern United States. Used like althea. Rose of China, Chinese hibiscus. Grown mostly for ornament, this shrub or small tree also has astringent and demulcent properties. Guinea sorrel, Jamaica sorrel, reselle; a tall annual plant found in the tropics of the Old World. The herb is useful as a diuretic and refrigerant. Also called Jamaican sorrel, is a strong grower whose calyx is harvested for use in sauces and jellies. A perennial herb found in Indochina. The root is said to be highly effective against excessive mucous discharge (blenorrhagia). A trailing shrub found in the tropical countries of Asia and Africa. It is used to soothe coughs and as an emollient. Corkwood, Cuban bast, mahoe; A shrub or tree found in tropical countries. The inner bark has mucilaginous and emollient properties. 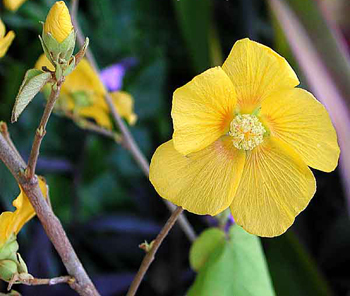 Flower-of-an-hour, Venice mallow; originally from central Africa, now found as a weed in North America. The plant has mucilaginous and emollient properties. 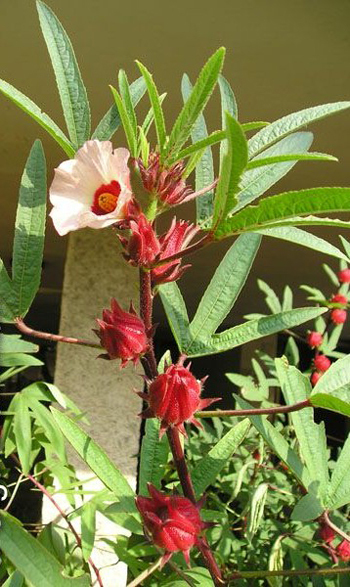 Grows wild in Egypt, India, and the East and West Indies; it is also cultivated elsewhere. Marshes. Maryland to Florida; Alabama to Indiana. 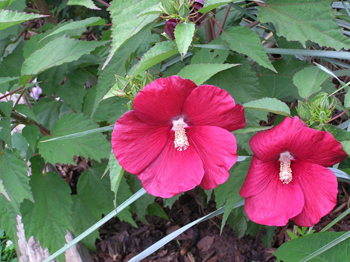 In herb and spice shops hibiscus is sold under the name of Nubia flowers, red mallow, African mallow, carcade, or roselle; all these terms refer to hibiscus flowers. These are the dried calyxes and outer calyxes, harvested during fruiting season, of H. sabdariffa L. A shrubby member of the mallow family that is probably native to Africa but grows also in China, Mexico, Thailand, and the Sudan. Slightly tart taste. The flowers do markedly improve the taste of all tea blends to which they are added. An emulsion made from the seeds is said to be useful for spasmodic problems. An emulsion mad with milk can be used for itchy skin. In Egypt, the seeds are chewed to relieve stomach problems, to soothe the nerves, and to “sweeten” the breath. Egyptians also consider the seeds to have aphrodisiac powers. Abounds in mucilage. Leaves and roots of this plant, like those of related species and genera, used as demulcent and emollient in dysentery and lung and urinary ailments. Rose of China, Chinese hibiscus. Grown mostly for ornament, this shrub or small tree also has astringent and demulcent properties. A decoction of roots is used as an eyewash in Malaya; the bark is used in Asia as an emmenagogue (encourages menstrual flow); the flowers are said to be astringent. 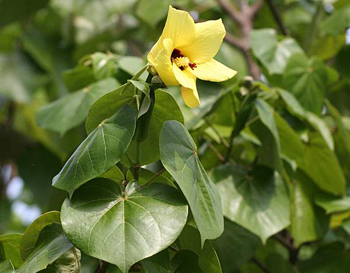 The flowers are usually used for fevers and minor stomach and intestinal complaints. The Sanskrit name for the hibiscus flowers is Japa, used in Ayurvedic medicine to treat dysmenorrhea, cystitis, cough, fever, syphilis, gonorrhea, and as a blood purifier. Hibiscus tea is rose-colored with lemony flavor. Served hot or iced. Delightful summer drink in its cold form. Commercial hibiscus teas are made either from the flowers or from the calyces of the flowers. All potentially toxic. Degree of toxicity unknown.